Arteriovenous malformations (AVMs) are congenital lesions composed of a complex tangle of arteries and veins connected by one or more fistulae (see the image below). They most commonly occur in young adults, with morbidity and death occurring in 30–50% and 10–15% of patients, respectively. 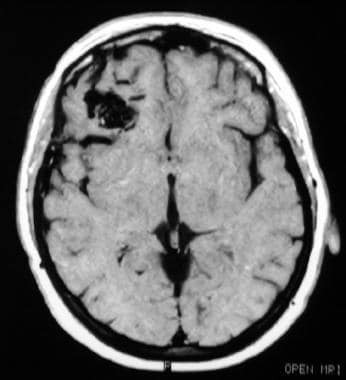 T1 axial MRI showing a small subcortical arteriovenous malformation in the right frontal lobe. Computed tomography (CT) scanning: Easily identifies intracerebral hemorrhages, raising suspicion of AVM in a younger person or a patient without clear risk factors for hemorrhage; however, this modality can identify only large AVMs. Invasive treatment is recommended for younger patients with 1 or more high-risk features for an AVM rupture. Older individuals and patients with no high-risk features may be best treated through management of the medical aspects of the illness alone; in such patients, anticonvulsants for seizure control and appropriate analgesia for headaches may be the only treatment recommendations necessary. Hemorrhage from cerebral arteriovenous malformations (AVMs) represents 2% of all hemorrhagic strokes. A clear understanding of the diagnostic and treatment algorithms involved with AVM management is imperative, because AVMs are a cause of hemorrhage in young adults. AVMs are congenital lesions composed of a complex tangle of arteries and veins connected by one or more fistulae. The vascular conglomerate is called the nidus. The nidus has no capillary bed, and the feeding arteries drain directly to the draining veins. The arteries have a deficient muscularis layer. The draining veins often are dilated owing to the high velocity of blood flow through the fistulae. How the abnormal vessels appear or exactly when the process begins is unknown. Deranged production of vasoactive proteins is under investigation as the angiogenetic link to pathophysiology. AVMs produce neurological dysfunction through 3 main mechanisms. First, hemorrhage may occur in the subarachnoid space, the intraventricular space or, most commonly, the brain parenchyma. Second, in the absence of hemorrhage, seizures may occur as a consequence of AVM: approximately 15-40% of patients present with seizure disorder. Finally, but rarely, a progressive neurological deficit may occur in 6-12% of patients over a few months to several years. These slowly progressive neurological deficits are thought to relate to siphoning of blood flow away from adjacent brain tissue (the "steal phenomenon"), a concept that has been recently challenged. Neurological deficits may be explained alternatively by the mass effect of an enlarging AVM or venous hypertension in the draining veins. Reported detection rates range between 0.89 and 1.24 per 100,000 person-years according to reports from Australia, Sweden, and Scotland. The prevalence of cerebral AVMs in Scotland has been estimated to be 18 per 100,000 person-years. Although 300,000 persons in the United States may harbor AVMs, only 12% of AVMs are estimated to become symptomatic. Death occurs in 10–15% of patients who have hemorrhage, and morbidity of various degrees occurs in approximately 30–50%. Hemorrhage: In population-based studies, 38–70% of brain AVMs present initially with hemorrhages. The overall risk of intracranial hemorrhage in patients with known AVM is 2–4% per year. Patients presenting with a hemorrhage are at increased risk for rebleeding, particularly during the first year after the initial hemorrhage (recurrent hemorrhage rate within 12 months after initial hemorrhage: patients with hemorrhagic presentation 7–33%; patients with nonhemorrhagic presentation 0–3%). [6, 7] Hemorrhage rates progressively converge with time for both patients groups after 1 year. Clinical and angiographic features associated with the risk for hemorrhagic presentation are male gender, small AVM size, location in the basal ganglia or posterior fossa, deep venous drainage, single or only few draining veins, high pressure in the feeding arteries as measured during angiography, and intranidal and flow-related feeding artery aneurysms. Although the initial presentation of a cerebral hemorrhage may be indistinguishable from those of other causes of hemorrhage, the neurological deficit in AVM-related hemorrhage tends to be less severe compared with a non–AVM-related hemorrhage. Recovery of AVM-related hemorrhage tends to be better, partly because of the relatively younger age of patients with AVM and partly because of functional cerebral reorganization in patients with cerebral AVMs. Seizures and epilepsy: Seizures unrelated to hemorrhage occur as the presenting symptom in 15-40% of patients with brain AVM. These may be focal or become secondarily generalized. Satisfactory treatment of seizures is usually possible with standard anticonvulsants. Presentation with seizures is associated with young age, large AVM size, lobar location (especially temporal lobe), and feeders mainly from the middle cerebral artery. Patients with brain ruptured AVM, especially if it is of cortical or subarachnoid location, are at increased risk to develop seizures and epilepsy similar to patients with this type of hemorrhages of other causes unrelated to brain AVM. Headache and migraine: In the general population, headache due to a brain AVM is an extremely uncommon cause. Headache unrelated to hemorrhage occurs in 4–14% of patients with AVM and may be the presenting symptom. The headache may be typical for migraine or may be present with a less specific complaint of more generalized head pain. Despite the presumed congenital origin of AVMs, the clinical presentation most commonly occurs in young adults. AVM hemorrhage or seizure as an incident event may occur in young children or adults older than 40 years; however, childhood migraine is common. A history of subtle learning disorder is elicited in 66% of adults with AVMs. This suggests early effects that are largely subclinical and do not come to medical attention. Guo YH, Chen HX, Xie RM. [Effects of qi-supplementing dominated Chinese materia medica combined with rehabilitation training on the quality of life of ischemic post-stroke fatigue patients of qi deficiency syndrome]. Zhongguo Zhong Xi Yi Jie He Za Zhi. 2012 Feb. 32(2):160-3. [Medline]. [Guideline] Ogilvy CS, Stieg PE, Awad I, Brown RD Jr, Kondziolka D, Rosenwasser R. AHA Scientific Statement: Recommendations for the management of intracranial arteriovenous malformations: a statement for healthcare professionals from a special writing group of the Stroke Council, American Stroke Association. Stroke. 2001 Jun. 32(6):1458-71. [Medline]. Weinsheimer S, Kim H, Pawlikowska L, Chen Y, Lawton MT, Sidney S, et al. EPHB4 gene polymorphisms and risk of intracranial hemorrhage in patients with brain arteriovenous malformations. Circ Cardiovasc Genet. 2009 Oct. 2(5):476-82. [Medline]. Laakso A, Dashti R, Juvela S, Niemelä M, Hernesniemi J. Natural history of arteriovenous malformations: presentation, risk of hemorrhage and mortality. Acta Neurochir Suppl. 2010. 107:65-9. [Medline]. Stapf C, Mast H, Sciacca RR, Berenstein A, Nelson PK, Gobin YP, et al. The New York Islands AVM Study: design, study progress, and initial results. Stroke. 2003 May. 34(5):e29-33. [Medline]. Mast H, Young WL, Koennecke HC. Risk of spontaneous haemorrhage after diagnosis of cerebral arteriovenous malformation. Lancet. 1997 Oct 11. 350(9084):1065-8. [Medline]. Halim AX, Johnston SC, Singh V. Longitudinal risk of intracranial hemorrhage in patients with arteriovenous malformation of the brain within a defined population. Stroke. 2004 Jul. 35(7):1697-702. [Medline]. Park SH, Hwang SK. Transcranial Doppler study of cerebral arteriovenous malformations after gamma knife radiosurgery. J Clin Neurosci. March 2009. 16(3):378-384. ARUBA Investigators. Unruptured brain arteriovenous malformation trial. [The Internet Stroke Center]. Feb 2006. [Full Text]. ARUBA Study. Unruptured brain arteriovenous malformation trial. [ARUBA Study Site]. Feb 2006. [Full Text]. Lawton MT, Kim H, McCulloch CE, Mikhak B, Young WL. A Supplementary Grading Scale for Selecting Patients With Brain Arteriovenous Malformations for Surgery. Neurosurgery. 2010. 66(4):702-713. Hernesniemi J, Romani R, Lehecka M, Isarakul P, Dashti R, Celik O, et al. Present state of microneurosurgery of cerebral arteriovenous malformations. Acta Neurochir Suppl. 2010. 107:71-6. [Medline]. Sahlein DH, Mora P, Becske T, Nelson PK. Nidal embolization of brain arteriovenous malformations: rates of cure, partial embolization, and clinical outcome. J Neurosurg. 2012 Apr 27. [Medline]. Parkhutik V, Lago A, Tembl JI, et al. Postradiosurgery hemorrhage rates of arteriovenous malformations of the brain: influencing factors and evolution with time. Stroke. 2012 May. 43(5):1247-52. [Medline]. Kano H, Kondziolka D, Flickinger JC, et al. Stereotactic radiosurgery for arteriovenous malformations after embolization: a case-control study. J Neurosurg. 2012 May 25. [Medline]. Sheehan J. Radiosurgery. J Neurosurg. 2012 Jan. 116(1):1-2; discussion 9-10. [Medline]. Castel JP, Kantor G. [Postoperative morbidity and mortality after microsurgical exclusion of cerebral arteriovenous malformations. Current data and analysis of recent literature]. Neurochirurgie. 2001 May. 47(2-3 Pt 2):369-83. [Medline]. Al-Shahi R, Bhattacharya JJ, Currie DG, Papanastassiou V, Ritchie V, Roberts RC, et al. Prospective, population-based detection of intracranial vascular malformations in adults: the Scottish Intracranial Vascular Malformation Study (SIVMS). Stroke. 2003 May. 34(5):1163-9. [Medline]. ApSimon HT, Reef H, Phadke RV, Popovic EA. A population-based study of brain arteriovenous malformation: long-term treatment outcomes. Stroke. 2002 Dec. 33(12):2794-800. [Medline]. Boggs W. Stereotactic Brain Radiosurgery Helps Small Unruptured Arteriovenous Malformations. Medscape Medical News. Jan 08 2013. [Full Text]. Hartmann A, Mast H, Mohr JP, Pile-Spellman J, Connolly ES, Sciacca RR. Determinants of staged endovascular and surgical treatment outcome of brain arteriovenous malformations. Stroke. 2005 Nov. 36(11):2431-5. [Medline]. [Full Text]. Hillman J. Population-based analysis of arteriovenous malformation treatment. J Neurosurg. 2001 Oct. 95(4):633-7. [Medline]. Hofmeister C, Stapf C, Hartmann A, et al. Demographic, morphological, and clinical characteristics of 1289 patients with brain arteriovenous malformation. Stroke. 2000 Jun. 31(6):1307-10. [Medline]. [Full Text]. Maruyama K, Kawahara N, Shin M. The risk of hemorrhage after radiosurgery for cerebral arteriovenous malformations. N Engl J Med. 2005 Jan 13. 352(2):146-53. [Medline]. Nataf F, Ghossoub M, Schlienger M. Bleeding after radiosurgery for cerebral arteriovenous malformations. Neurosurgery. 2004 Aug. 55(2):298-305; discussion 305-6. [Medline]. Pollock BE, Link MJ, Brown RD. The Risk of Stroke or Clinical Impairment After Stereotactic Radiosurgery for ARUBA-Eligible Patients. Stroke. 2013 Jan 3. [Medline]. Axial T2 MRI showing an arteriovenous malformation with hemorrhage, in the territory of the left posterior cerebral artery. T2 coronal MRI showing an arteriovenous malformation in the left medial temporal lobe. Magnetic resonance angiography showing a left medial temporal arteriovenous malformation. Angiogram (anteroposterior view) showing an arteriovenous malformation in the deep left middle cerebral artery territory measuring approximately 3 cm in diameter, with a deep draining vein (arrow).